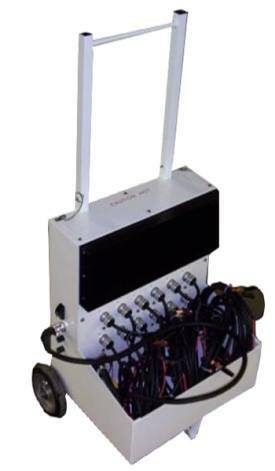 This charger was developed by Advanced Target, now ATA Defense Industries, for quickly charging multiple batteries in military target systems. It is a roll-around assembly with 6 inch wheels, and a convenient handle at 42 inches. The handle can easily be folded down or removed. It is useful for any lead acid battery, including flooded lead acid, spiral wound, or VRLA batteries. Each battery charging circuit is fully independent with its own smart controller, and status LEDs. The power supply has AC input 115 VAC or 230 VAC 50/60 cycle, switchable with a lockable toggle switch on the side. It is heavy gauge welded aluminum construction. The individual charger boards monitor fault conditions as well as monitor each 12V battery separately for state-of-charge and end-of-charge. Can also be used to charge multiple car batteries, motorcycle batteries, and marine batteries. The list price for this rugged charger is $3250. Connectors Alligator clips on 9 foot cords. The charging cords are permanently attached to the charger. LEDs Each battery charging station has two LEDs. Isolation The configuration consits of 4 lots of 3 chargers each. Each batch of 3 have a common ground, but they are isolated from the other batches. Therefore, by chosing the right combinations you can charge six 24V batteries by connecting the cables in series. Getting the combinations wrong will not damage the charger, it will just express its concern by extingishing the corresponding green LEDs until the problem is corrected.